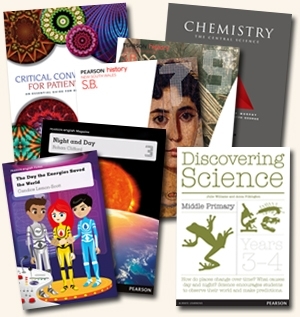 I’ve just received the very exciting news that the series that my title ‘THE DAY THE ENERGIES SAVED THE WORLD’ featured in has just won the Educational Publishing Australia Awards 2014 for best primary resource. I’m proud to announce that it’s officially classed as a top resource for schools, perfect for year 3-6 teachers. I was recently given the opportunity to write a Year 3 reader for Pearson Education. It was a lot of fun writing a fiction story based on the educational science topic of ‘night and day.’ Through my fiction reader ‘The Day the Energies Saved the World’ I could explore and explain this concept to kids by taking my characters on a futuristic science fiction adventure. What was even more exciting was that my eldest daughter happened to be learning this very subject at school this term, not long after the book first came out. To top it all off it’s very exciting to have the series win an award. A picture of the shortlisted series featuring ‘The Day the Energies Saved the World.’ You can read a bit more about it on the Pearson Education blog. A friend of mine sent me a photograph of the Clearwing butterfly a few years ago. It was beautiful but what appealed to me most was the description of how things look and how colours are enhanced looking through the Clearwing’s translucent wings. I always had this image in mind, but when my main character, Jett, came along I knew it represented him and the life journey he goes on – finding beauty amid ugly life circumstances. My current novel, Unloched, is a contemporary fiction novel for adults. Clearwing will be geared more towards a young adult (YA) audience. Jett would be played by someone like Sean Keenan, who starred as Gary Hennessy in Puberty Blues. The girl Linda, who Jett meets and falls in love with, appears at first as an angel. So she’d have to have an angelic quality to her – someone like Rachel Hurd-Wood who featured in Tomorrow: When the War Began would be perfect. Clearwing is the story of small town Aussie teen, Jett, who battles between following the path of his alcoholic father and choosing his own direction, as his life spirals out of control. Neither, it will be traditionally published. My second daughter was just a baby when I wrote this book so I had one session every week to write. It took me about a year to complete. Not too sure, as there’s not a lot out of ‘real life’ stories out there for the YA audience right now with the focus on fantasy novels. In some ways, I think Clearwing could be compared to the Tomorrow series by John Marsden because in both the characters show the strength and resilience of teenagers and how it’s that time of deciding who you want to be as a person despite everything life can throw at you. There were three things that inspired me to write this book. The first was the Clearwing photograph I mentioned. The second was Jett, who began as a teenager telling his point of view from the stance of being a bully (That first ‘fight’ scene made me wonder what kind of background that kid had and the kind of life choices he might have to face). Lastly, the setting was inspired by a small, country town where I used to take dance classes as a teenager. As I delved into the history of the town, my character Jett emerged more fully. I hope that young adults will be interested in the journey of the characters and the questions it raises about the people who come into our lives and how they can help shape who we become. Here’s your chance to win a signed copy of ‘Stinky Ferret and the JJs.’ Taking part in the competition is easy – just post up to 50 words on the Books for Little Hands blog describing your funniest or scariest animal experience by July 1, 2012. Good luck! I’m a writer. That came from being an avid reader. So it’s only natural that I would impart my love of books to my children. From the day both my daughters were born I read books to them. By the time they were crawling a weekly visit to the library was part of our routine and once they were toddlers story time sessions were attended in addition to borrowing two or three books. I converted our old fireplace into accessible bookshelves for my children, I shuffled through boxes of pre-owned books at book fairs and books became a regular and special gift from everyone from Mum and Dad, to the Easter Bunny and Santa Claus. Admittedly, there are board books that have been chewed more than looked at and pop-up books with the pop outs ripped out. Some visits to the library have involved little more than an opportunity to practise pre-walking skills along the bookshelves. Sometimes I am the only one listening to the librarian recount the story of the ‘The Very Hungry Caterpillar’ while my daughter tries to hug a baby who is an unwilling recipient of the display of affection. But to me books and reading are an integral part of life, and the signs of this have showed from the very beginning. When my first daughter was born she began by listening to the sound of my voice as I read to her. By the time she was sitting up she was interested in the texture and the feel of books, and soon began pointing out pictures on a page. Most of the time I read to her two or three times a day, but always before bedtime. Once she was walking it was she who began handing me books to read until my voice would become parched from storytelling. By the age of two she could sit for a half hour session of story time at the library, which was a welcome break for my vocal chords. Also by that age she was speaking in full sentences and people often expressed amazement at her early vocabulary. As a pre-schooler she moved on to predicting storylines and in addition to our usual book before bed, she now also tells a story of her own making. Next year she will start school, and I feel confident knowing that she will go in with the ability to write and read simple stories. With my second daughter, however, it was not the same. I was surprised when as a newborn she wasn’t at all interested in the books I pulled out. She would turn her face away, uninterested. Flabbergasted, and a little dismayed, I would put the book back on the shelf. She did, however, show an interest in singing and music, so I repeated popular nursery rhymes and songs in my out of tune voice to her joy and amusement. I still persisted with showing her books, however, and attempting to read to her. Over time she started to show signs of interest – though at first it was just to turn over the pages. I had to accept that she wasn’t ready to be read to. I began to worry that her speech wouldn’t develop in the same way as her sister’s, foreseeing all sorts of problems with school and reading, and life in general as she grew. In the meantime I persevered but only gave her as much as she wanted. Rather than attempt to read a story to her we would look at the pictures together, naming them as we went. Soon she stopped flipping over the pages so much. She began pointing out pictures and then naming them. Eventually she allowed me to read a story to her and started picking out her favourites for me to read. 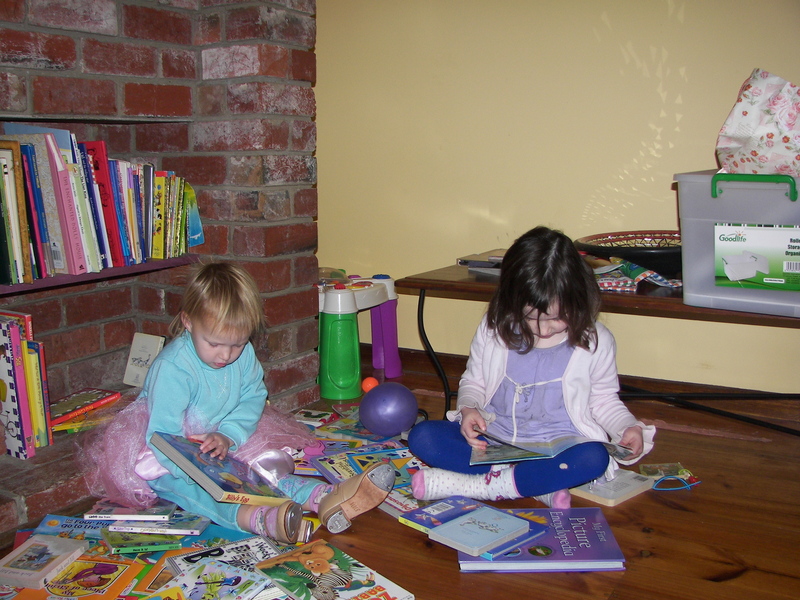 One of the most beautiful moments was when I came into the lounge room to see my two girls sitting on their little fold-out couch, side by side, each with a book in their hands. Despite these early fears, my youngest daughter also began to speak well early on. Now, having just turned, she has also shown an amazing skill at remembering song lyrics. Despite my out of tune voice her pitch is spot on and she demonstrates the inflections within the words of the song. Though she didn’t sit down with stories in the way I had expected or initially hoped, I discovered that if I followed her lead and allowed her to learn in the way that suits her the love of books is already matching that of her sister. Despite my desire to pass this love on to my children, and the esteem in which I held books and reading, I didn’t really know the extent to which it has helped my children. Recently, I attended a literacy seminar and I was amazed to discover just how important pre-literacy skills are. If children haven’t been exposed to a wide range of language as well as books and stories by school age, research indicates it is inevitable that the child will struggle with reading and writing. This comes not only at prep level, but throughout his or her school life and into adulthood. But why is it unlikely children not exposed to books will fall behind without intervention? Frank Oberklaid, from the Centre for Community Child Health, demonstrated in a graph how between birth and six years of age the brain synapses are forming and reach their maximum number. The brain is not fully developed at birth thus these are the formative years in regard to key understandings when it comes to literacy skill development. The first three years of life are most crucial in this regard. As we age the synapses begin to decrease, and a child of 10 years old brain will have twice as many as an adult brain. So while I thought I was merely passing on my own passion and love of books and reading, I discovered I am actually giving my kids the best possible start in life. So when it gets late and it would be all too easy to bypass reading them a book before bed, I remember what I’ve learned and make the time. Not to mention the upset it would cause to deny my girls one of their favourite things – story time! Right now I’m reading the second in Cornelia Funke’s ‘Ink’ series. After being totally hooked on her first book ‘Ink Heart’ I am now equally addicted to the second in the series, titled ‘Ink Spell.’ If you like fantasy, great characters and books with even more ‘heart’ than the first title suggests, I recommend reading this series (and I don’t mean just going to see the movie). While the film ‘Ink Heart’ was enjoyable and brought to life some of the characters, much of the soul of the story, I felt, was lost. There is much more to be found within the pages of the novel itself, so by all means see the film, but I would also recommend the book. But be warned, if you have big assignment due or lots on right now – wait! It’s a big book that’s hard to put down once you start. Something to think about. Do you agree with this? What does reading bring for you?